Since December 2012, representatives from the Colombian left-wing guerrilla movement, the Fuerzas Armadas Revolucionarias de Colombia (Revolutionary Armed Forces of Colombia, or FARC), have been in peace negotiations with the Colombian Government in Havana, Cuba. This is the fourth attempt in the past 30 years to find a solution to the continuing violence in Latin America's most war torn nation. The negotiations in Havana have been slogging forward, but have found some successes on the issues of land reform, drug trafficking, and future FARC member political participation. The nation has now suffered through five decades of conflict, and the results have been brutal: some 220,000 dead and another five million people are refugees. There are many warring parties. The FARC, the largest and oldest group, claims to be fighting for agrarian reform and anti-imperialism, with the ultimate goal of the violent removal of the Colombian government. A second left-wing guerrilla movement, the Ejército de Liberación Nacional (the National Liberation Army, or ELN), claims that it is battling for a Marxist revolution and the liberation of Colombia. The most murderous group involved in the fighting has been the Autodefensas Unidas de Colombia (United Self-Defense Forces of Colombia, or AUC), a collection of right-wing paramilitary death squads responsible for the preponderance of the savage human rights crimes that have plagued this nation. Peace talk progress has been on again off again for five decades. Last year, on December 20, the FARC announced a unilateral ceasefire, halting the fighting for only two months. In March, the Colombian government and the FARC reached an agreement on disassembling the landmines planted throughout Colombia, a very hopeful step forward, as Colombia is one of the most extensively mined countries in the world. However, last month a group of FARC guerillas broke the ceasefire, killing 11 government soldiers in the Cauca province. Through the many frustrations, as talks stop and restart, as hopes rise and sag, it is easy to lose sight of the fact that solid progress already has been achieved. One important area of accord is land reform. The FARC and the Colombian government have worked out many of the details on this issue, one that the FARC has long maintained was central to its mission. The deal spells out land redistribution details of two million hectares under 26,600 claims, land ownership rights, the legal protections for small farmers, as well as the terms of financial aid to farmers, including loans to reduce rural poverty. Meaningful agreement has also arisen on the matter of FARC members' reintegration into the political process. The parties have established clear assurances for the guaranteed rights of non-violent political opposition, rules for setting up new political parties, greater transparency for elections, and the mapping of new special congressional districts. As reporter Sibylla Brodzinsky has noted, "the security of [the FARC] members [joining the political process] … is particularly significant because the FARC's previous foray into electoral politics -- the Patriotic Union party [Unión Patriótica or UP] in the 1990s -- resulted in the murder of as many as 3,000 members." FARC will not disarm and join the political process unless their safety can be assured. The FARC and the government have also agreed to work together to reduce the production of cocaine and international illegal drug trafficking. This is an important step for the FARC, which has relied heavily on drug trafficking as their key revenue source over the past several decades. With citizen non-combatants accounting for about 80 percent of the deaths in the conflict (according to a study by Colombia's National Centre for Historical Memory), the rights of victims' families remains a major issue to resolve. The National Center for Historic Memory found that the FARC was responsible for 17 percent of the killings and state forces were responsible for 10.1 percent. The report also found that "the remaining murders were carried out by right-wing paramilitary groups or unidentified actors." A group of sixty officials is now working to determine the proper reparations that would be offered to each different category of victims. There is much work for them left to do. Negotiations are continuing on the terms of disarmament of the rebel military. This will be a difficult matter, for the FARC members are dispersed throughout highly rural and remote regions, maintaining strong ties with the illicit drug business as their sole source of revenue. The FARC has earned roughly $200 million in revenue through their exportation of cocaine into the illegal international drug market and their imposition of a farm tax on the coca farmers. Likewise, the timeframe in establishing and signing a formal peace deal remains unresolved, as all the agreements remain frozen until a finalized agreement is signed. One thing is becoming clearer: both the FARC and the Colombian government appear to acknowledge the impossibility of a military victory. Meanwhile, Bogotá has instituted a conditional lift on the arrest warrants and travel bans for the FARC leaders, on May 17, 2015, announcing the "limited" dissolution of 182 arrest warrants against the FARC's commander-in-chief, Rodrigo Londoño Echeverri (or Timochenko). This action allowed Londoño Echeverri to travel to Cuba and take on a greater role in the Havana negotiations. Additionally, Londoño is playing a role in trying to bring the ELN into the talks. In a related move, Colombia has now declared a suspension of the anti-coca chemical spraying campaign. As Juan Forero, the South American bureau chief for the Wall Street Journal, has reported, "right now, one of the big things happening is that the government is in the midst of peace talks with the guerillas, which would put an end to a very long conflict. And the Government's point of view is that fumigation is really a kind of militaristic approach in regions that are now peaceful." Bogotá seems to be attempting to assuage the concerns of not only its citizens and their public health concerns, but also the FARC and its connections with Havana negotiations. On May 22, 2015, 27 FARC soldiers were killed by a Colombian military air strike in the region of Cauca in western Colombia. Among the 27 killed was FARC Commander and Peace Negotiator Jairo Martinez, who was killed in the air strike while reportedly on an "educational mission" to inform the rebels about the peace process. This action came after President Juan Manual Santos (2010-present) had dissolved the previous suspension of air strikes on the rebel forces in the wake of the killing of 11 Colombian soldiers by FARC forces in the same region. The government's objective was to kill Javier el Chugo, the second in command of the FARC unit. On May 26, just hours after peace negotiations resumed in Havana following the death of the 27 FARC soldiers, Colombian government forces killed FARC Commander Roman Ruiz while fleeing the Choco region with four other FARC rebels. The continued attacks by Bogotá could undermine the positive momentum in the peace negotiations in Havana, as approximately 40 FARC rebels have been killed since the Colombian government resumed their raids. Two days later, on May 28, three Colombian military soldiers and three FARC fighters were killed in a confrontation in the northeastern Colombian municipality of Arauquita, Arauca Department, an area known for its oil facilities. The Colombian military believes that the FARC unit was instructed to attack the Caricare oil compound. Despite the bloodshed, on May 29, the Colombian government and the FARC have began locating the hundreds of mines throughout Colombia for dismantlement, identifying four areas in the northern region of Antioquia that require clearance. Furthermore, on May 31, the port city of Buenaventura, Colombia's largest foreign trade port, lost power after an electrical tower was destroyed following two explosions. The Colombian military reports that the act was most closely under FARC rule. Meanwhile, the negotiations in Havana continue to move forward amid the growing tension within the past week. Many already have seen dramatic changes within the overall social climate in Colombia, moving the nation towards peace and resolution, yet a formalized peace resolution still remains in the distance. 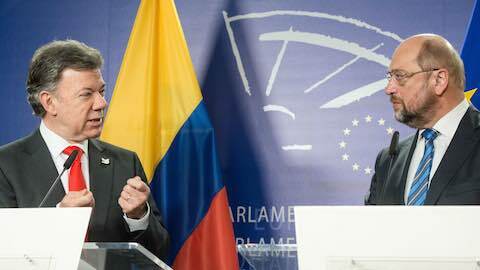 The negotiations have transcended many obstacles and will hopefully continue, yet the strike on the FARC rebels by Bogotá threatens the process.To end the conflict, both parties must exercise far greater restraint. Colombians long to live in peace, and an agreement is so close now. "The Guerrilla Groups in Colombia." United Nations Regional Information Centre for Western Europe. Accessed May 28, 2015. http://www.unric.org/en/colombia/27013-the-guerrilla-groups-in-colombia. Libardo Cardona, "FARC Cease-Fire Lapses, Deemed Success," Associated Press, January 21, 2013. "Colombia Farc Rebels Declare Indefinite Unilateral True -- BBC News." BBC News. December 17, 2014. Accessed May 28, 2015. http://www.bbc.com/news/world-latin-america-30525871. "What Is at Stake in the Colombian Peace Process? -- BBC News." January 15, 2015. Accessed May 28, 2015. http://www.bbc.com/news/world-latin-america-19875363. "Colombia's Coca Farmers Face Uncertain Future As FARC Negotiates Peace." NPR. January 20, 2015. Accessed May 22, 2015. http://www.npr.org/2015/01/20/378681784/colombias-coca-farmers-face-uncertain-future-as-farc-negotiates-peace. "Colombia to End Anti-drug Crop Dusting Amid Health Concerns." PBS. Accessed May 24, 2015. http://www.pbs.org/newshour/bb/colombia-end-cocaine-killing-crop-dusting-amid-health-fears/. "Colombian FARC Negotiator 'Killed in Bombing Raid' -- BBC News." BBC News. Accessed May 23, 2015. http://www.bbc.com/news/world-latin-america-32897176. Daniels, Joe. "Colombia's FARC Guerilla Suspends Unilateral Ceasefire After 26 Killed in Military Airstrike." VICE News. May 22, 2015. https://news.vice.com/article/colombias-farc-guerrilla-suspends-unilateral-ceasefire-after-26-killed-in-military-airstrike. Winsor, Morgan. "FARC Commander Roman Ruiz Killed By Colombian Government Airstrike Hours After Peace Talks Resume." International Business Times. May 26, 2015. Accessed May 27, 2015. http://www.ibtimes.com/farc-commander-roman-ruiz-killed-colombian-government-airstrike-hours-after-peace-1937929. "Border Battle With FARC Claims Three On Each Side." PanAm Post. May 29, 2015. http://panampost.com/panam-staff/2015/05/29/border-battle-with-farc-claims-three-on-each-side/. "A Journey Toward Colombian Unity"